Did you meet your significant other while attending USM or a predecessor school? We want to hear about it! The Alumni Association is collecting real-life love stories featuring our alumni community members. Whether you dated in high school or re-connected later in life, we want to hear your story! Visit www.usmk12.org/alumni to find out more. Students in USM's Global Scholars program had a chance to meet with senior U.S diplomat R.P. 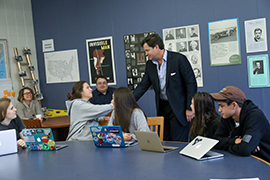 Eddy '90, who visited campus in January and participated in the sixth annual crisis simulation. Student groups represented a variety of non-governmental organizations and presented proposals to Eddy, who role-played as U.S. President Donald Trump, in an attempt to influence the president and subsequent public policy. Learn more about his visit here. What Brought You Back to USM: After doing a long-term substitution, I was offered a position the following year. It became apparent that much of what I took for granted as a student here was a boon to my professional life: incredible collegiality, parent buy in and presence, phenomenal facilities, and great support from administration. I had worked in schools that had some of these attributes but not the whole package found at USM. The really cute history teacher was an added bonus! All of these things make what felt like a job elsewhere a true joy. This really is an exceptional community! 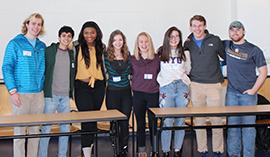 USM seniors were once again treated to a special Q&A session with recent alumni from the class of 2018 who visited during their winter breaks. The group of graduates spent an hour with seniors to answer questions about college life, including living on their own or with roommates, class schedules, and balancing social life with academic responsibilities, among others. "USM truly helped me become the best version of myself. The main thing that I’ll absolutely miss the most is the faculty. They challenged me, encouraged me, and supported me to become a better learner, leader, and citizen." 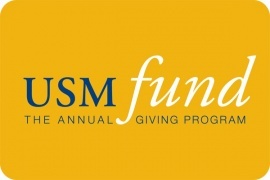 Please consider making a gift to the USM Fund, gifts of all sizes truly make a difference! Click here to make your gift. The Our Common Bond campaign is making wonderful progress thanks to the generosity of our USM community members. The campaign recently surpassed 90 percent of the $27 million goal! Click on the latest Our Common Bond newsletter to read more about the campaign, including photos and details from our dedication event held this past fall, or visit the Our Common Bond website. The Fall/Winter 2018-19 issue of USM Today is hot off the presses. Go behind the scenes with USM alumni, learn about how students benefit from the Upper School house program, discover how Hannah Hakami ’18 transformed a school hallway as part of her Tower Project, and say au revoir to Pamela Nosbusch, who will retire in June after 41 years. Visit the USM Today website for those stories and many more!